Sterling Silver Horseshoe Ring with a little bling! 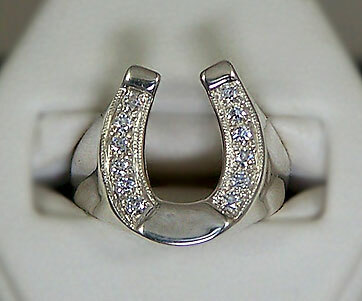 Here we have set a Sterling Siver Horseshoe ring set with Cubic Zerconia. A whole lot of bling for a little buck! Dimensions: 18mm wide at the top tapering down to 2.5mm at the bottom fo the shank. Pictured and priced in STERLING SILVER. Have it your way today!